Low carb stuffed peppers recipe with beef, pork, walnuts, and cheese. 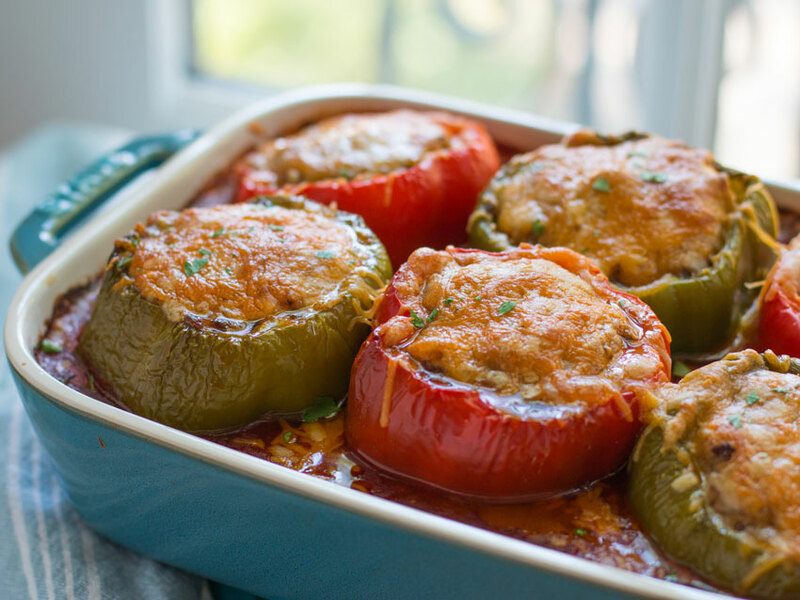 These peppers are baked in tomato sauce and make the ultimate keto meal. This stuffed bell pepper recipe is a gem! It’s low carb and keto friendly, plus the addition of walnuts and not cooking the ground beef before stuffing the bell peppers makes this one of the best recipes for stuffed peppers I have ever had! I am not sure why people choose to brown the beef before stuffing. This results in the beef drying out or the stuffed pepper does not have enough time to cook. If you are looking for more stuffed recipes that are keto, check out my low carb keto stuffed pork chops and my stuffed and rolled chicken breasts. I don’t know about you, but I want my stuffed peppers soft enough where I can actually eat the pepper and the filling moist and juicy. Who said I can’t have my cake and eat it too!? Not only is the flavor and texture of these low carb stuffed bell peppers the bomb, but this is also a keto recipe. Most recipes for stuffed peppers call for using rice or other starchy fillers. I work around that by using walnuts and a combo of ground pork and beef for a soft, creamy texture. Stuffed bell peppers cook in the oven for 1 hour and 30 minutes, so they need some liquid love to prevent them from shrinking like a frightened turtle. Most marinara sauce recipes are loaded with sugar and high carb veggies, but if you just take a 28 ounce tin of good quality whole tomatoes, San Marzano are the best. Puree that into a sauce and season with salt and pepper, and you just made a keto tomato sauce. The stuffed peppers don’t absorb the cooking liquid. They just stay nice and moist, so don’t worry about eating too many tomatoes if you are on keto. Plus, I only use a couple tablespoons at garnish over the tops of the bell peppers at the end. The first step in making the perfect stuffed peppers recipe is to saute the aromatic veggies, the onions, zucchini, and garlic need to sweat out there moisture before being stuffed inside the green and red bell peppers. Next, add some tomato paste and walnuts to the pan and let the nuts toast and the paste cook so the flavors develop. Add a bit of chicken stock to loosen the mixture up and then you can add it to the ground meats. If you want juicy meat inside the bell peppers, (and who doesn’t?) then I recommend a mixture of ground beef and pork, which will add some nice fat to the blend and prevent it from drying out while baking in the oven. Total cook time for the stuffed peppers is 1.5 hours, and during the last 30 minutes, sprinkle a healthy amount of shredded cheese over the top so it melts in the oven. Cook stuffed peppers at 350 degrees F for 30 minutes with tin foil covering the peppers. 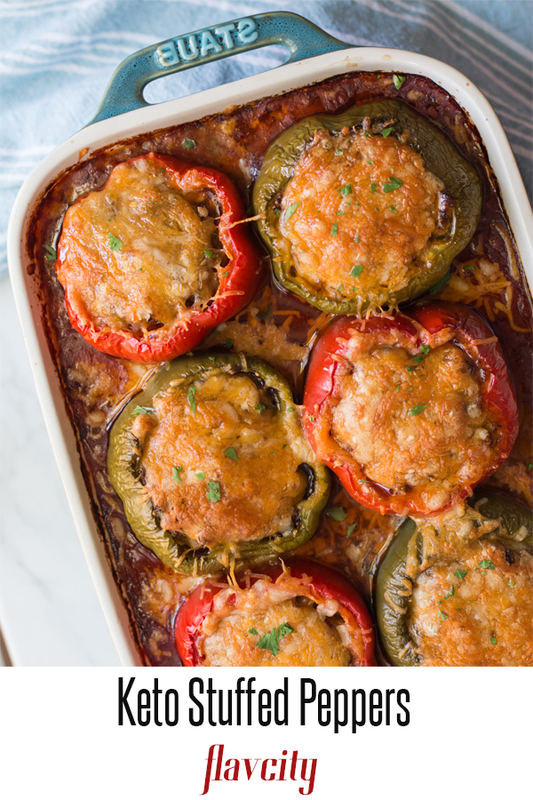 Remove the foil, cook for another 30 minutes, and then top the peppers with cheese and bake another 30 minutes or until the internal temperature of the peppers is 155 degrees F.
The best way to reheat stuffed peppers is in a 350 degree F oven for 8-10 minutes. You can also reheat them in a microwave, but make sure to cover them with a wet paper towel and don’t overheat or the peppers will dry out. Cook stuffed peppers will last in the fridge for 5 days or can be frozen for 2-3 months. 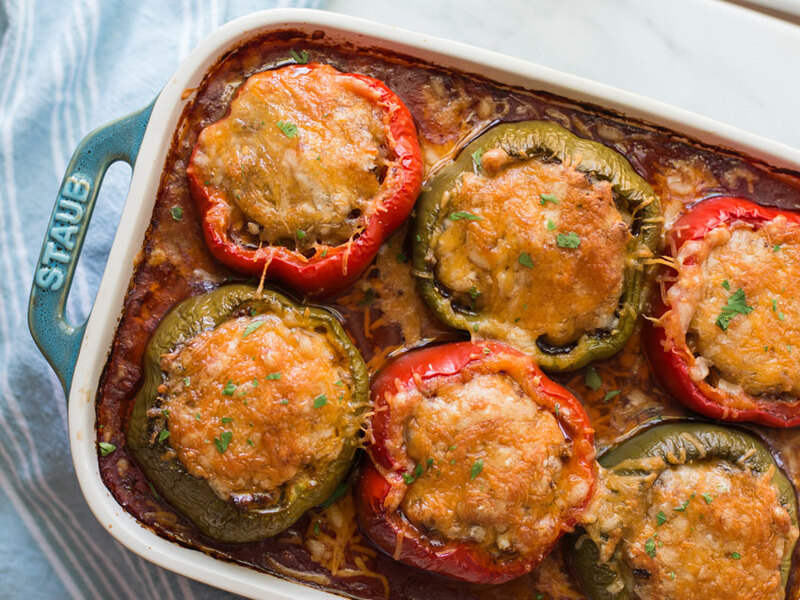 These low carb stuffed peppers are filled with juicy ground pork, beef, walnuts, and zucchini, baked in tomato sauce, and topped with shredded cheese. The ultimate keto meal for stuffed bell peppers. Pre-heat oven to 350 F. For the filling, pre-heat a large non-stick pan just over medium heat along with 2 teaspoons of oil. Add the onions, zucchini, thyme, ½ teaspoon salt, and a few cracks of pepper, mix well. Cook for 10 minutes, stirring often. Meanwhile, cut the tops of the bell peppers off and use your hands to carefully rip out the seeds and membranes, you can watch the video to see how it’s done. Add the walnuts, garlic, tomato paste, smoked paprika, cumin, and cayenne to the onion mixture and cook for 3 minutes, stirring often. Add the chicken stock to the pan and cook for 1 minute, or until most of the liquid is absorbed and the mixture looks wet. Set aside. Place the ground beef and pork in a large bowl, season with 1 teaspoon of salt, a few cracks of pepper, and add the egg. Use your hands to mix everything very well, making sure the beef is thoroughly incorporated with the pork. Add the veggie mixture to the beef and use your hands, or a large spoon if the veggies are still hot, to mix everything very well. It’s ok that the veggies are hot because you will be cooking the peppers immediately, but if that is not the case, make sure the veggies cool before adding to the beef. Add the tomato puree to a baking dish along with ½ teaspoon of salt and few cracks of pepper, mix well and then add the bell peppers. Use a spoon to stuff the peppers to the top, making sure to pack the mixture down. Cover the baking dish with tin foil, place on a sheet tray and bake for 30 minutes. Remove tin foil and bake another 30 minutes. Meanwhile, combine the cheddar cheese and parmesan in a bowl and mix well. After the peppers have been cooking for 1 hour, top them with the cheese and bake another 25-30 minutes. If you have a thermometer, remove the peppers from the oven when internal temperature is 155 F.
Allow the peppers to rest for 10-20 minutes before serving, plate them up with some reserved tomato sauce, enjoy! The peppers will keep in the fridge for 5-6 days and get even better the second and third day. You can freeze the stuffed peppers for 3 months and either place frozen peppers in a 350 F oven until hot, or thaw them and warm in the oven. I’m Loving this recipe of the Stuffed Peppers, and I’ve printed the recipe but the picture’s on your recipe’s don’t print out and when your 76 you need visuals, to go with a recipe…LOL..Thanks Bobby keep up the good working I am Loving your KETO Recipe’s their just what I need, keep them coming……Roberta Smith. Ha, thanks Roberta! I will see if I can fix that, enjoy the peppers! You need to look at your calculations. There are 18 net carbs in one serving not including the tomato puree. Hey Sarah, the macros are correct, I use 3 sources to verify them. Don’t rely soley on myfitnesspal, it’s off many times I have noticed. Just finished having these for dinner – they were great. I did make a few subs, and normally won’t rate a recipe when I modify it, but my changes were pretty minor. I didn’t have smoked paprika, so I used ancho chile powder. I figured the smokiness would be about the same. Also, instead of the San Marzano tomatoes, I used marinara that I canned last year. I was surprised that the zucchini was basically unnoticeable. Hard to tell it was even there, but I’m sure it added moisture. Also, total bake time in the recipe is 1 1/2 hours. Mine were basically done at the one hour mark, but I let them go another 10 minutes to melt the cheese. This one is a winner. Thanks Bobby. Right on Tim, those are good subs for the recipe. So glad you enjoyed! This recipe turned out great! We used ground turkey, chicken, and Italian sausage. Thanks for sharing. Great combo of ground meats, braavo! What can I substitute for the walnuts that would equal the texture? My son is allergic. Thank you! 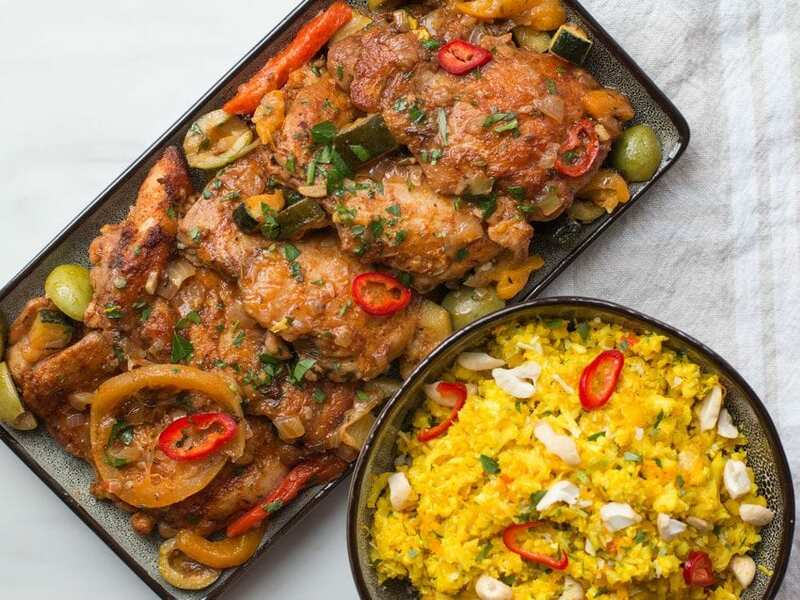 This is a flavor-packed, delicious and visually beautiful dish. I had visitors that are on keto and I wanted to make a couple of dishes that they would feel comfortable eating. They really enjoyed these. I also like that these are highly customizable, though these are so good if you follow the recipe. Will definitely make these again. Keep dishes like this coming guys. Easy to make and delicious. The meat stays together and doesn’t fall apart! Definitely making it again. Thanks, Bobby! Right on Adam, love to hear that..thanks! My husband & I watched your Keto Stuffed Peppers video, and our mouths were watering watching it. So we made your recipe 2 nights ago, and they are AMAZINGLY delish! They are definitely packed with flavor, and shockingly filling. 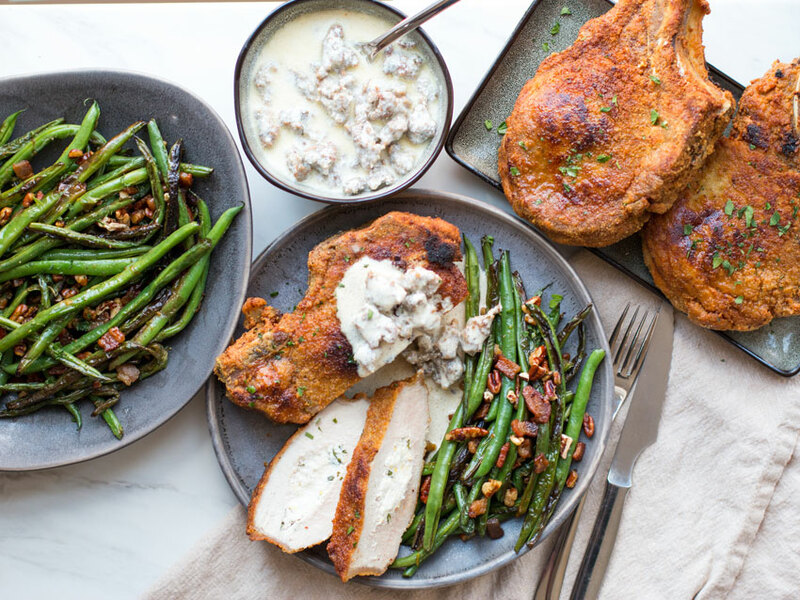 We ate leftovers last night, and they were even better than the 1st night. There is only one pepper left, and I am going to savor every last bite today. That is the first recipe of yours that we have tried, as we have just recently discovered FlavCity. 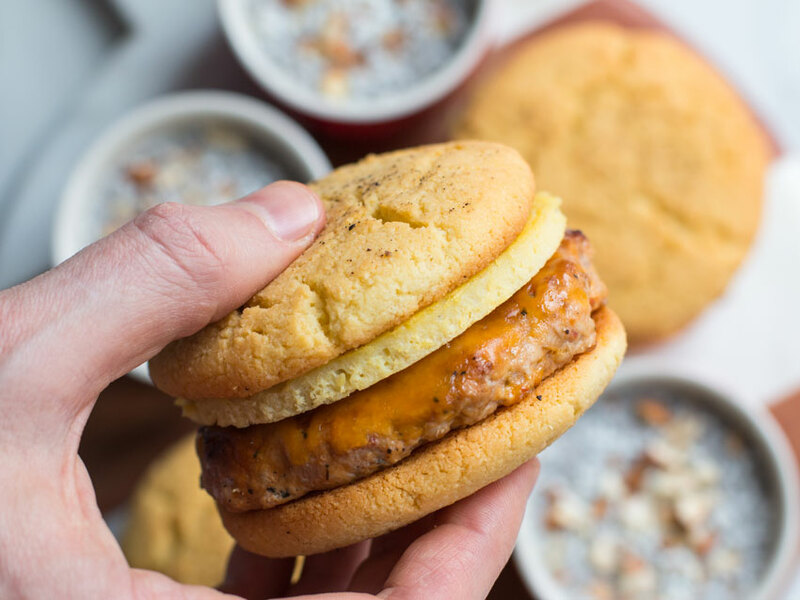 If all of your keto recipes are this tasty, then you can expect 2 new devoted followers here 😉 Thanks! Fantastic to hear Monica..these defo get better the next day..dont you love it when that happens 😉 Thanks! ok, so I made these stuffed peppers last night and my family loved them! We did not miss the rice and loved the fact that they were keto friendly. Thanks! so glad to hear you guys loved the stuffed peppers Casey, thanks! I made these for meal prep this week and they were fantastic! I even wanna try it with ground turkey or chicken next time. Thanks for the epic stuffed bell pepper Bobby! I had the pleasure of cooking this recipe, and the peppers tasted great. Just one question, how did you rationalize a net carb of 6.4g per serving. I understand that a good brand of san marzano tomatoes like Cento will limit the sugar load significantly and pretty much just give you pure tomato. But 28oz of the stuff still leaves you with about 23g of net carbs. Does some of the carbohydrate content degrade with the high heat of cooking? Any more information on this point would be much appreciated. Delicious, I don’t miss the rice at all in these peppers. My favorite part is the crunch from the walnuts mixed with the zucchini. I have used this meat mixture for other recipes as well. So glad to hear it, Dan!! Keep on cooking! That is so great to hear! We agree! 😀 Thank you!